As in the case of kinematic Stirling engines, there are numerous implementations of the free-piston version. Much of the development of this type of engine is owed to Sunpower Inc. of Athens, Ohio. Figure 3.16 shows a simple form of the engine dating from 1986. Figure 3.16 A simple free-piston Stirling engine with a linear alternator as load. The operation is somewhat similar to that of a kinematic beta Stirling. springs. Flexure bearings are diaphragms that are quite rigid radially but allow substantial axial motion of the oscillating parts of the machine. Such bearings are of very predictable performance, are practically lossless, and have extremely long lives. Noncontact gas bearings are also used. 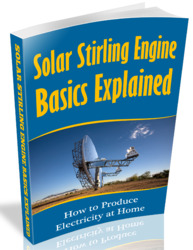 If all Stirling engines indeed, have, high efficiency, operate with many different heat sources, pollute substantially less than corresponding internal combustion engines, and are quite noise free, how come they have not dominated the world of heat engines? The answer is that the kinematic version of the Stirling whose development has consumed a large amount of time, effort, and funds, has some serious, nearly insurmountable problems, most of which are absent in the free-piston version developed much more recently. One area of difficulty is the need for lubrication and, consequently, the need for seals to separate the lubricated parts from the high-pressure working fluids part. This is the main reason for the limited life of the kinematic engine. Free-piston engines need no lubrication. Kinematic engines, unlike free-piston ones, require piston rings that degrade over time. 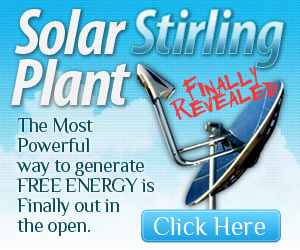 They also require costly and complicated mechanisms to permit power variations. See the subsection on implementation of kinematic Stirling engines. Free-piston systems designed to generate electricity incorporate a (linear) alternator as an integral part of the hermetically sealed machinery, avoiding leakage problems. The frequency of the generated a.c. is determined by the mechanical resonance of the oscillating displacer/piston mass and can easily be adjusted to 50 or 60 Hz (100 Hz in some space applications). Free-piston engines have only two moving parts, both of which are entirely inside the sealed compartment with no mechanical connection with the exterior and are, therefore, mechanically much simpler and more reliable than kinematic engines. The moving parts make no solid contact with other components, being separated from them by noncontact gas bearings. There is no life-limiting component wear. Free-piston engines are extremely easy to start and can be made essentially vibration free by operating them in opposed pairs with a common expansion space. Power modulation is achieved rapidly and in a simple manner by varying the phase angle between the displacer and piston motions. This is accomplished by varying the stiffness of the gas spring interconnecting these two components. Fast response and high efficiency are insured over a great power range. In contrast, in kinematic engines, the phase angle is determined by mechanical linkages and is, therefore, fixed. For a more complete discussion of the advantages of the free-piston over the kinematic engine, read Lane and Beale (1997). The great reliability, flexibility, and long life of the free-piston Stirling engines achieved in recent years are opening great possibilities for this technology. Among other applications, it not only might replace the RTG in deep space missions, but may also become the power supply of choice for the planned moon base and for many military applications as well. As pointed out earlier, a heat engine depends for its operation on a heat source and a sink, which, by definition, must be at a lower temperature. 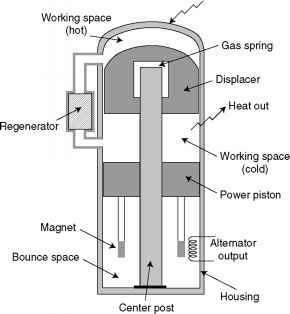 Almost invariably, the sinks are at nearly the ambient temperature while the source is driven by combustion, nuclear reaction, solar energy, and so forth, to a relatively elevated temperature. However, it is possible to use a source that is at ambient temperature, while the temperature of the sink is lowered by a supply of a cryogenic substance. Ordonez (1997) and his collaborators at the University of North Texas have proposed such cryogenic engines. Their experimental engines operate on an open Rankine cycle and use liquid nitrogen for the sink. Figure 3.17 shows a schematic representation of the setup. The liquid nitrogen in the cryogenic reservoir is under the (adjustable) pressure, pi. The liquid is fed to a heat exchanger to which enough heat is added (from the outside air) to produce gaseous N2 at the pressure, pi, and the temperature, T1. Figure 3.17 A cryogenic heat engine using an open Rankine cycle.